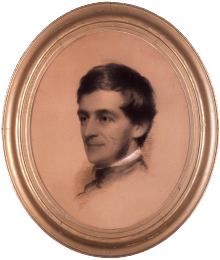 Ralph Waldo Emerson in 1846, in a charcoal portrait by artist Eastman Johnson. Emerson was long a mentor to the younger Henry David Thoreau. While Thoreau was living at Walden Pond, from July, 1845 through September, 1847, he completed work on the first draft of what would be his first book, A Week on the Concord and Merrimac Rivers. In a November 14, 1847, letter to Emerson, Thoreau reports on his lack of progress in securing a publisher, and his indifference to pursuing the matter further. Emerson, in Manchester, England, at the time, replied on December 2 that the book would be of interest to many, and advised Thoreau to self-publish it "at once." Emerson's advice can be viewed as a critique of Thoreau's publishing plans, given privately, and with honest respect. Thoreau accepted Emerson's well-intentioned but quite mistaken advice, leading to a mountain of debt, and Thoreau's now-famous quip, "I have now a library of nearly nine hundred volumes, over seven hundred of which I wrote myself." Not all criticism is valid, even when the giver is more experienced, an acknowledged expert, and widely respected. The portrait is part of the personal collection of Henry Wadsworth Longfellow, courtesy Wikipedia. In Part I of this exploration of criticism, we explored guidelines for criticism that arise from considering the needs and responses of giver and receiver. In this Part II, we explore the content of criticism messages, and the settings in which we deliver those messages. For criticism, delivery style is part of content, because we experience style as part of the message — and that's often the intention of the giver. Word choice, voice tone, gestures, and posture all contribute to style. A hostile, attacking style invites rejection of the message and possible retaliation. Choose a style that's respectful, humble, and kind. Instead of coercing the receiver, invite the receiver to engage in joint exploration. When the content of the criticism includes an evaluation of the receiver as a person, rather than the receiver's actions or beliefs, the receiver can experience pain. Receivers cannot change who they are; they can only change beliefs or make different choices in the future. Criticizing someone as a person invites retaliation and degrades relationships. Strive for clarity about the consequences of actions and beliefs. Focus on mutual understanding of those consequences. Once consequences are clear, the receiver can make better-informed choices in the future. If the cause of the problem lies outside the realm of individual choice, criticizing the choices of individuals won't help. Very little good comes of offering criticism of actions or beliefs to someone who was operating well within organizational norms. Be certain that you understand the root cause of the problem. If what you have to say applies to many people, consider the possibility that the system is the cause, rather than the people in it. Consider individual interventions only after you eliminate systemic causes. unfairly attackedcriticism can humiliate receivers. Humiliation limits the receiver's ability to calmly consider the message, which is a prerequisite for change. Whether humiliation is a goal or a tactic, rethink the entire endeavor. Privacy is essential. If privacy is rare in the ordinary course of events, do something extraordinary to obtain privacy. If the message for the receiver could apply equally to others as well, the receiver can feel persecuted and unfairly attacked. Focusing on just one individual, even to provide an example to others, rarely works. People are free to talk with each other. If two people carry out similar actions, and you're reluctant to offer criticism to one, consider carefully before offering it to the other. Would you like to see your comments posted here? rbrenJoopUwEoQSLIRytJner@ChaclvhekEjNouDETHLgoCanyon.comSend me your comments by email, or by Web form. I offer email and telephone coaching at both corporate and individual rates. Contact Rick for details at rbrenulDdsofeKxszmDhtner@ChacfVsqaOvHZmeIghnCoCanyon.com or (650) 787-6475, or toll-free in the continental US at (866) 378-5470.